The January meeting of the Castlewood Oak Valley Neighborhood Association will be a planning meeting to look at suggested programs for 2004. Please come with your suggestions and ideas on topics of interest to you and your neighbors. This is your chance to be a part of the planning process, so please plan on attending. A guest at the meeting will be Mr. John Blunt, who owns property on the NW corner of Monarch Dr. at Manchaca Rd. He is in the process of selling the property and would like to address COVNA regarding the potential buyer; which, if acceptable, will require a zoning change for the property. If you live on Monarch Dr or anywhere in the neighborhood and are interested in learning about the potential buyer, please plan on attending. It is once again time to show your support for the Castlewood Oak Valley Neighborhood Association. A renewal form is availableby clicking here. As we usher in a New Year, we also usher in a couple of new officers in COVNA. I am privileged to serve the next two years as the President of this neighborhood association. My involvement has covered a little over four of the seven years I have been a resident on Vassal Dr. with my wife Tricia. We live in the “little brown house” at 2304, but if our plans go through, it won’t have much brown on it for very long. I found COVNA a great way to get to know other folks in the neighborhood and rather than someone else making decisions which might affect me, I wanted to be a part of the process. As a neighborhood association, we don’t have a lot of authority to make far-reaching decisions compared to a homeowner’s association but we do have interaction with neighboring developers, the city planning commission, and we have a representative on the Austin Neighborhoods Council, another role I have enjoyed filling for the past three years. Currently, I am serving as Secretary of ANC and will have news of interest to pass on, periodically. As I took the office of President, I left one year of my term as Newsletter Editor uncompleted. We are fortunate to have Doug Tabony, one of my neighbors on Vassal Dr. stepping in to serve the remaining year. If you have any news of interest to COVNA, please pass it on to Doug. If you have any concerns or ideas for projects, speakers, and/or activities for the coming year, please contact me or any of the other officers who are listed on the front of the newsletter. Longtime neighbor and former COVNA newsletter editor and president Frank de la Teja will be one of the interviewees on an upcoming American Experience. The program, titled "Remember the Alamo," looks at the Tejano (Mexican Texan) side of the Texas War of Independence, particularly from the perspective of Jose Antonio Navarro, one of two Texas-born signers of the Texas declaration of independence, and prominent San Antonio citizen. Frank, a professor of history at Texas State University, will appear early in the program providing background information on life in colonial and Mexican San Antonio. The first airdate is Monday, Feb. 2, 2004, on PBS. The COVNA annual holiday party was held on December 15. A great time was had by all. Food, drink, and desserts were abundant. The company was cordial and a holiday atmosphere pervaded the event. Time was taken for embedded business which included electing Doug DuBois as president and appointing Doug Tabony to replace him as newsletter editor. 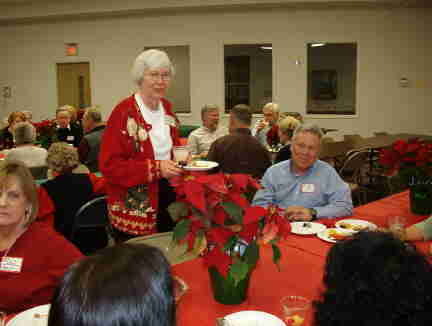 The poinsettias which decorated the tables were given away as prices. Below is a picture taken by Frank de la Teja. This is a dull neighborhood. That’s a good thing. Excitement in the neighborhood usually stems from negative events. We chose this neighborhood seven years ago because it's quiet and pleasing to the eye, and, as we have come to find out, full of good people. We encountered much more excitement when we moved into our last house in the Allandale neighborhood in 1980. The neighborhood association was involved in a large-scale zoning rollback for approximately 1240 acres. Our two-block street ended up the epicenter of controversy. The rollback effort uncovered an under-the-table deal that had been struck to build a three-story apartment complex of mostly efficiencies on our quiet block. Through the efforts of 3 families including ours, this intrusion was averted. My part landed me a position on the Steering Committee of the Allandale Neighborhood Association. Early in my tenure, another exciting event occurred, the Memorial Day flood, which had a catastrophic effect on the Shoal Creek corridor. The Allandale Association was instrumental in bringing about changes including redesigning bridges and the lowering Northwest Park to alleviate flooding. The most exciting role I played after these events was organizing several 4th of July parades. Catastrophic and controversial events elicit interest, drawing large crowds to meetings. When things are going well attendance diminishes. In both exciting and dull times you can have a tangible impact on the quality of life close to home where it counts the most by supporting your neighborhood association with your membership and participation.